ROGER SCRUX CLAIMED THAT HE RECEIVED THE SKEETERS TAPE DIRECTLY FROM ARUBA LAW ENFORCEMENT - THEY GAVE EVIDENCE TO A BLOGGER! I only know what I have been told. I received the recording directly from the Aruban Police Department. 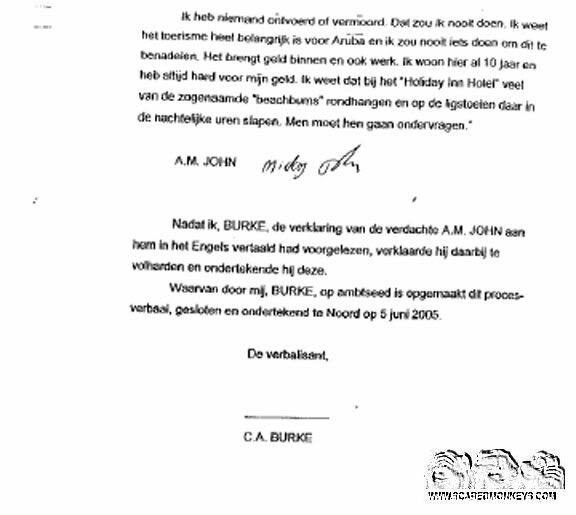 I was told that it is exactly what was provided to the NFI (Netherlands Forensic Institute) and verified as having not been manipulated in any way. Some people have speculated that I probably got this from a defense attorney or maybe one of the Aruban public relations groups. I did not get a copy from any of those sources. I simply would not have hosted the recording if it had come from anyone other than the proper authority. Receiving this directly from the Aruban Police provided me assurance and confidence that it was exactly what they maintained it to be. I think this may help to explain why the attorney's for Dr. Phil maintain the lawsuit and have stated they will not settle the case. Hope this helps. But in court papers filed Wednesday, attorneys for CBS, McGraw and Kay Skeeters -- widow of Jeremy Skeeters, a private investigator hired by McGraw to interview Deepak Kalpoe -- maintain the brothers are "libel-proof." They say the brothers' reputations were irreparably stained by prior published accounts of the Holloway case, meaning they cannot claim to have been damaged by the "Dr. Phil" broadcast. WHICH CAR IS THE QUESTION???? Satish says he's been attending "Penn Foster Online High School"
The Kalpoe’s were arrested by the ALE. They brought that upon themsleves. It was the 3 suspects who lied to the police and stated they returned Natalee Holloway to the Holiday Inn the night they drove off with her from Carlos ‘n Charlie’s. It was the suspects who lied about the two black security guards and implicated them in a crime where they were arrested. It was the three suspects who continually changed their stories and statements to the police and investigators. just you and me Mags. Kermit, Magnolia and 19 Guests are viewing this topic. Peter R. de Vries sold his new two reports [ the meeting Beth and Joran in jail and the extortion case] to CBS. They will broadcast it this weekend. On Sunday. Correction: They = SBS and CBS. I checked the CBS listings for Sunday...the usual programming and nothing related to this case. I would think that if there were to be an airing on CBS there would be advertising prior to the show. Perhaps the SBS airing will be viewed here at a later date. I'm never too far away. ISP Orange Nederland Breedband B.V.